MAKE Volume 25: The Arduino Revolution! Our Arduino Revolution section includes a primer that shows you how to build your own Arduino from scratch and how to program it to do different things, such as blink an LED, or play sounds. We also have an article about a new kind of drag-and-drop Arduino programming system, called ModKit, that allows you to program your Arduino without having to write code. 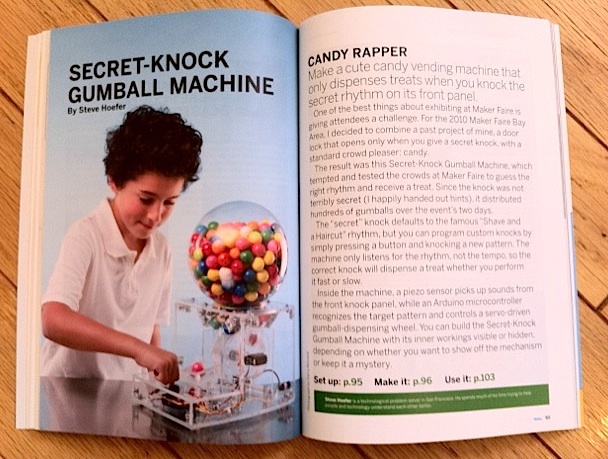 Other Arduino projects include making different kinds of game controllers using accelerometers or other sensors, converting a classic 1930s vintage telephone into a Skype telephone, making a a gumball machine that dispenses a treat only when you knock the secret rhythm on its front panel, and an automated yogurt maker. Whether you’re an experienced microcontroller user, or a complete newbie, I think you’ll find our Arduino Revolution section of MAKE magazine to be fun and useful.